Objective tracking of namma metro from the data accumulated from the newsletter given out by BMRCL from feb 2009 upto july 2009 for reach-1. This will clearly give us trends on the progress of namma metro. I intend to update this data as and when new data is available. Here are the graphs. Overall the reach-1 seems to chugging along to meet the december 2010 deadline. Also there is news that underground section has been awarded. Nice work Vinod..however ground realities makes it hard to accept the graph..
Its too linear for comfort! They have fired a consultant.. they say..On site we can still see Navayuga ppl around! Moreover when one fires a consultant there is a trough expected in the progress! CMH road is in a mess..with hardly anyworkers doing anything..
Ulsoor station work is also goin pain stakingly slow..please take a BMTC bus going towards majestic/market from OMR through ulsoor and you will see the 'progress'! However I will try to pitch in with some regular photo updates..
Vinod, with your commitment on updating this site with Metro progress, We will bring back the old Metro tracking pages (remember, we had these for BIAL, BTRAC etc). If more people can join Vinod here - we can collaborate for some nice community tracking of Bangalore Metro project. What you would have to do is very very simple. And then, write Metro posts on praja 1-2 times a month, just make sure you use the right tags on the posts ("BMRC", "Namma Metro"). We will restore the Metro tracking page in a couple of days. Need to clarify terminology and the data itself for non civil engineers on this forum. b. Pile caps - the concrete mat that rests on the piles. It looks like one pile cap for about 4 to 5 piles. Your number are all cumulative. d. Spans - at the July rate - about 12 months. Spans clearly are the bottleneck to progress. However if stretches are complete then I assume rails can be laid without waiting for the entire 7 km to be done. Could you add the other parts as well if possible - rails, rolling stock, stations without which no trains can run. Thanks again - this is good data based tracking. thanks srivathsa for explaining the jargons....Yes the number are all cumulative. My hunch;observing the day to day progress, they will complete it much faster. Some activities to be note regarding reach 1 are. 1.A part of the reach 1 contract has been offloaded to gammon india. Gammon india will be doing segment casting and launching from trinity to CMH road i guess. 2.Another set of launching trusses hasbeen put in place near old madras station by navayuga engineering, they should start launching segments from this end very soon. 3.As regards the stations, old madras station by IVRCL has showed good progress. Piers are already showing up. Piling work happening for trinity station by punj loyd. Working is slow at ulsoor station, which is one of the first stations were work was started. yes will add rails, rolling stock stations as we go along. And BMRCL wants to lay tracks on the MG road stretch first and take up tracking laying as when stretches are complete of 1 km or more. Piers - added 26 in July vs 18 in June and 15 in May. At this rate will finish in 3 months. Constrained by pile caps. Pile caps - Added just 5 in July vs. 17 in June. Will take 8 months at this rate. 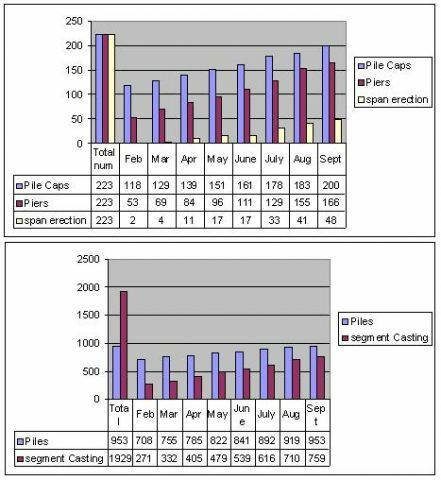 Segment casting - 94 in July vs 77 in June. At this rate will take 13 months to finish casting. Unless they pick up on spans, Dec 2010 is going to be tough. shot using my mobile phone, so quality is lacking. In the last 2 weeks i observed the now infamous GAMMON getting down to work on reach-1. A part of reach-1 work has been offloaded from navayuga to gammon. 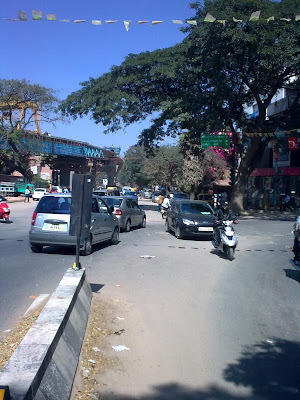 I tried to trace the path of metro from BYP towards MG road..Here are some photos of the same.. Unfortunately nothing to report from CMH road as there is almost no visible activity there. 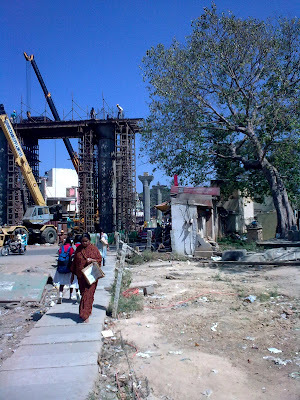 Sorry for the image quality..it was very sunny today..and this is the best that cud be done with my phone cam..
Today i observed the first span being erected near the old madras road station towards CMH road station via 100ft road. with this we have three launching girders in action simultaneously on reach-1. Gammon has also started work on bridging the pillars at trinity junction and barricades placed for span erection from old madras station towards byappanahalli depot.. And also most of the pillars on the CMH road is completed. I noticed today that the first single pier after the three double piers with beams (for curved section) at MG rd-Brigade rd intersection is not positioned squarely at the center of the pier cap. This single pier is on the section past the intersection, towards Trinity junction. I will try to get a picture soon & post it here. Anyone noticed this ? 157 users have liked, including you. "The Bangalore Metro Rail Corporation Limited has finished pile work on Reach 1 - from Chinnaswamy Stadium to Byappanahalli. Pile work includes foundation work for the metro rail project. Reach 1 has 223 pile caps and work on them will be completed by September end. Piers and pier caps will be constructed over pile caps. 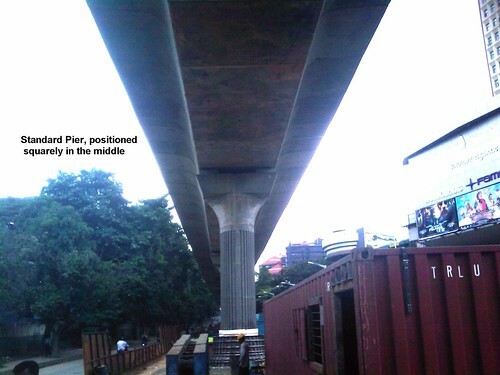 Work on pier and pier caps is expected to be completed by October end according to BMRCL. BMRCL wants to start launching of girders by November at all places on Reach 1. The casting of girder segments is already underway on MG Road. A total of 710 segments have been cast out of the 1,929 segments on Reach 1. Reach 1 is expected to be completed by December 2010 and commercialisation of the metro train will start from January 2011." at both the ends of Phase 1. This will offload traffic like anything. I am currently near Boston, USA. I took a Red Line here recently and also had been to NY two weeks back. I felt Boston Subway is much cleaner although Network is not wide spread. Coaches are manufactured by Bombardier. It makes too much noise inside the coach. Subway stations are all very hot until you get inside the train since there is no airconditioner in the station. New York Subway Stations I felt very dirty and lot of nuisances happening in the stations. Rides are expensive. It is not based on the distance travelled, anywhere in the network it is the same charge. I have not experienced the Delhi Metro. But our fellow Indians who accompanied me told that Delhi Metro is very cleaner and far better compared to Metros here. Since Bangalore will have very few underground stations in the downtown area, I think we may not much face the heating problem. Also we need strict security in the stations to avoid the 'nuisances' like NYC. DLF is planning for Feeder Metro in Delhi and Upcoming Metro of Hyderabad after the Gurgaon Metro. Here is the link. Pile caps - they seem to have some plan to speed it up. They needed to put in 40 more at the end of July. So they plan to put it in @20/month. Worse comes to worst - Oct end should be feasible. Piers - seemed like they were keeping up a good pace on this and Oct end should be doable. Spans - this seems to be the slowest moving item. Now that Vinod says they have put in girder launchers at OM Road, maybe progress will pick up. Apart from the civil engineering works there remains a whole lot of other work. d. Most important - recruiting of staff and training. I hope they have their eyes on this one. Can't wait for Jan 2011. I want to do a "First Day First Show". Metro - Delay in Procurement of Rolling Stock ? As per this report in DH, there are indications that rolling stock supplies may be delayed. @Naveen: That report seems quite old. I have read the same 2-3 months ago. According to recent news reports , the design of the coaches is in the final stages. The first coaches/train set will be delivered by October next year for testing. As regards ticketing the tender has awarded. Not sure if signalling equipment and track laying work has been awareded. Need to check. At Naveen (regarding unsafe pier) - ask the design engineer if (s)he considered eccentric loads and consequent moment in the pier. If they did, for the amount actually on site, it should be OK. If not, they need to re-calculate and remedy it. The contractor's list has contact information for some of the engineers. At Vasanth - The metro in Washington DC is one of the cleanest. Thanks for pointing out the wordpress photo site. Response to query of rolling stock tender indicates that the tender was issued a while ago. Other tender information (not their status) is here. Also, updates on coach selection here. In this case the first lot comes from korea and then we subsequently make those on our own..
Read this on today's DH. Pile works completed on Reach 1. Seem to have speeded things up a bit. The headline is misleading though. I'm sure all viaducts will be ready by 2012, but doubt very much if tunnelling works & the multi-level UG section + city center at majestic will also be completed. BMRC was to start tunnel works this year, but have postponed it to next year. Unless, they move quickly on these huge jobs, the completed viaducts & stations (on south & west reaches) will be of no use as trains cannot be run there. They might then run trains on only East & North reaches, awaiting completion of these jobs ! The blame game will then begin - BMRC will claim that KSRTC had not handed over land in majestic in time, whilst KSRTC will state that land was not handed over to them by BMRC at Peenya for a bus terminal there. The minister will promise that all issues were being sorted out speedily ! There was a news item today that the Lido Mall was going out of business because of the metro construction..many shops within the mall closing out! This is quite discomforting..also this is the case with all CMH road shops and other narrow roads where metro is going.. When Mysore road flyover was being built by L&T made sure that they occupy just the exact space needed..nothing more..and they worked at a very fast pace.. The same approach is needed for metro projects too..we need to make sure that businesses dont go out of business because of the infrastucture project..which is being put in place because of the businesses! Metro needs to make sure that safe access to businesses during constuction is always provided! 1.43 mts is the width btwn rails for std guage and the metro coaches are 2.9 mts wide..so to run two trains on the stilts we will need atleast 6.5 mts total space on the spans.. Some places the width seems to be too small..is it so or is it just me? Understandably our trust in our agencies is not very high, but I think we can trust them to get this much right. Considering how much time one Domlur flyover took and one Richmond Circle flyover took, we have come a long way. 147 users have liked, including you. Distance between tracks - 4.2m (center to center). Width with trains standing on both tracks - 1.44+4.2+1.44 = 7.08m. Provison is also being made for emergency side walks (in case of train breakdowns). Assuming that sidewalks are 1.5m wide each side, viaduct width will have to be 1.5+7.08+1.5 = 10.08m (minimum). A news item in today's TOI reports that part of the area within the cricket stadium compound will be effected by Metro construction, though the earlier plan was to take it underground when passing there. This change is most likely because provisions for integration with HSRL terminal were planned later (on adjacent police grounds). I sent the below query to BMRC twice, but it went unanswered, i know we can use RTI, but is there any other way we can get the info without resorting to RTI everytime. "From your website i understand that separate tenders for tracking laying and Signaling were invited in February 2009 and October 2008 respectively. I would like to know have these tenders been awarded, if awarded can you please provide names of track laying and signalling contractors. I guess some sections on reach-1 are ready for tracking laying.eg: MG road stretch,consequently when will track laying commence. And also i see that you have put out the names of the civil contractors and their contact numbers on the website, which is commendable. It would be wonderful if could update the sheet with contracts awarded for track laying and signalling, ticketing etc as when they are awarded"
Refer my previous comment about a possible pier abnormality --- See pictures below .... this is the pier that, at first sight appears incorrect. I spoke to the engineer at the site who stated that the pier has been positioned at the geometric center of the width of the street to allow for equal road widths on each side. However, because the curve commences just before the pier, the viaduct is not squarely at the middle. This is taken care by larger scantlings for the pier (much stronger) & also an over-sized pier cap. 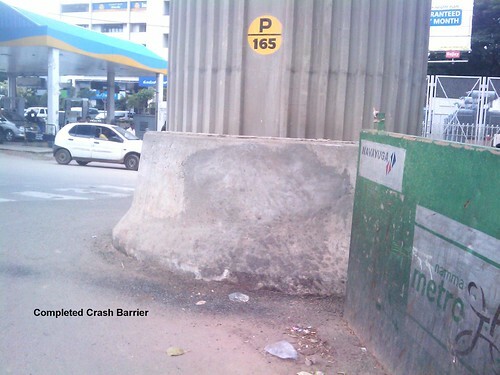 Crash barriers at the base of piers on MG rd is nearing completion. These are 150mm at the top & 450mm at the bottom, with 50mm of thermocole packed between pier surface & the barrier to absorb shocks in case of impact. A divider will also come up later. I have seen some offset piers like this in Taipei city, where pillars had to be located a little off because of some existing construction. If the loads are corectly calculated, should not be problem. All the pile caps have been completed on reach-1. From my observation, 2 spans completed in the first week of september near old madras road station. The pace of construction process is gathering steam which augurs well for everyone. Recently travelled on reach-3 sides. I could see only baricades and not much of work happening. According to the newsletter, a chunk of piling work in this reach has been offloaded from the original contractors IDEB-SUCG to Simplex infrastructure. In this reach BMRC has reacted switly, and has penalised the contractor for delay without wasting valuable time as happened in reach-1. Need to commend BMRC on this. May be they have finally got the hang of how to build a modern metro. The length of the UG section (updated) is now 8.822 km, or 8822 mtrs & tunnel works will commence only next year. Assuming that tunnel-boring with machines progesses at a rate of abt 10 mtrs a day - it wud take 882 days, or nearly 2.5 years ! If they bring in more machines (say, 4 machines & work from both ends of the two routes) & do about 20 mtrs a day, it would still take well over a year for this job alone, not to mention unforeseen delays. DMRCL has deployed 7 of the 14 TBM's for phase II of Delhi Metro..to complete a distance of 16 KM..multiple TBM's can be launched from different underground stations.. Since the underground stations are cut-cover, it will allow to start tunnelling in parallel..if westart in time and with the right skills and equipment in place..its not difficult! Lets see if VTU will confer a honorary doctrate to Mr.Sivasailam! 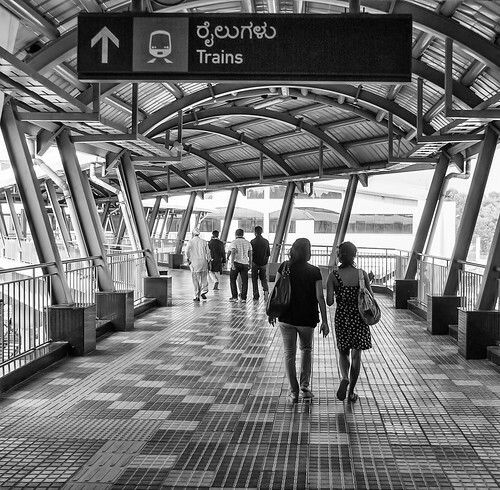 When will the average Bangalorean commuter finally be able to use the Metro? When will we be able to buy tickets and get station drops? When will the rolling stocks come to the city? Rolling stocks are expected to arrive in October-November 2010. Rolling stock available Oct-Nov 2010. When is driver training and the training for the rest of the staff going to happen? Or are they being sent to DMRC for the initial training and qualification? And then come back here almost ready to start operating the trains? I would have thought Nov 1,2010 would have been a better date coinciding with Rajyotsava. No? Going by the numbers there are approximately 8-9 segments to a span - 1929 segments for 223 spans = 8.65. They need to complete 15 spans a month for which they need to cast 130 segments each month (rounded off). Currently they seem to be going 7 spans a month and only 60-70 segments. They need to double the pace of segment casting - without segments no spans can be built. And then double the speed of spans. I noticed that segments are getting launched from the OMR side also. So at least the speed of launching will go up. Not sure if an additional casting facilities have been built. Gammon seems to have a rather new looking concrete facility near the Byp terminus. Maybe that is another casting area? Had written to BMRC about the driver training..it was clarified that drivers will be trained before the commercial operation of the trains in DEC 2010. They will also have simulators with BMRCL for training and to monitoring them on regular basis and upgrade their driving skills right from day one! 145 users have liked, including you. The board of the Bangalore Metro Rail Corporation Limited (BMRCL) that held its meeting here on Tuesday, awarded tenders for signalling and telecommunications (S and T) works to Alstom and to construct escalators at ‘Namma Metro’ stations to Johnson. The work on laying tracks for the 42.30 km route of the 'Namma Metro' project is likely to commence in February or March 2010 and will be completed in 140 weeks. “The work on laying of tracks would most likely begin in February next year at a pace of 400 meters a day. While we would supply the ballastless track, BMRCL engineers would lay the track. Reach 1 from Cricket Stadium on M G Road to Byappanahalli will be completed by October 2010, with the entire route on Phase I, expected to be over in September 2012,” announced L S Patil, the executive chairman of Patil Rail Infrastructure Private Limited, at a media briefing here on Thursday. 400 m of track/day = 2.4 km of track/week assuming 6 days operation. or 600 route-meteres of track. For 42 km it should take 70 weeks. Why 140 weeks? a. 140 weeks is probably the elapsed time. There will be delays because the viaduct is not ready and of course the underground stretch might not even have started!!! b. Why wait till Mar 2010 to start Reach 1? Aren't we wasting precious time? Any delay means that if the rolling stock is ready, then they can't do test runs. c. Also suprising that Mr.Patil still thinks that all the work will be done by Sep 2012 when we hear yesterday that the underground stretch is off by 6 months. So is there a plan to make up lost time? Or is the communication process also broken down? is the reason why they say 140 weeks..
Btw was checking on the non-ballast tracks being installed..its a pretty decent tech where the usual sleepers and the 'jelli' is not used! DMRC recent derailment that happened was apparently on at-grade section which did not have the non-ballast track..they had normal tracks where maintenance is high..btw DMRC has non-ballast for all elevated and underground sections.. Please check my calculations. I have already accounted for 2 sets of tracks. My assumption is that the 400m refers to only 1 single track. So 4 tracks for a route-km of track. And therefore 100m/day of route. that was stupid of me to expect wrong calculations from the man of numbers..apologies! Probably theres a different calculations around the 140 weeks...probably it aligns itself with the BMRC MPP or tracker cos they need to come in only when the platform is ready! Travelled today from OMR tracing the metro path..CMH road is now blocked for all traffic till Ulsoor police station..guess it will be like that for months..the work is very slow there! And why are the pillars on CMH road soo tall..its almost double the normal size?? Agree - it looks like elapsed time rather than processing time - the constraint being availability of finished spans ready to receive tracks. Wish I could get my hands on the NM.mpp file :). The Gantt chart would be most interesting to look at. 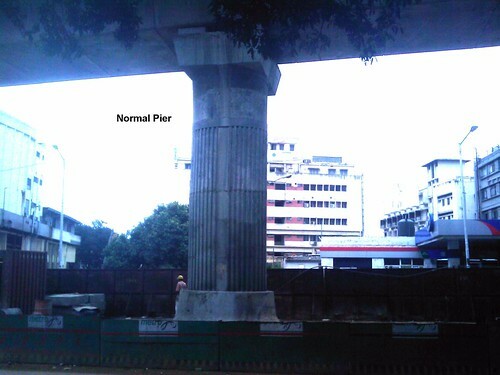 blrsri: At first looks even i thought why the pillars at CMH road are double the ones at MG road. But looking through details i realised it would be for maintaining the gradient of tracks to achieve the desired train speed limits. Good point. It is part of the same tender. That should add 50%. In all likelihood, the tracklaying machine lays 400m of track - 2 train tracks and 1 3rd rail a day. I can hardly see this as a manual operation with gangmen carrying 1 rail and then fixing it. Hopefully those days are gone. Instead of directly launching on the elevated tracks, why they can't do in some plain land like near Byappanahalli Depot area to test the track laying, third rail laying and actually test by running few model trains for atleast 500 metres or 1 km. Instead of seeing the unforeseen problem directly on the live tracks, why not see now itself. Nobody in India except for very few contractors have the experience in Metro Track laying except for few who have worked on Delhi Metro. It is all assumptions that we are going to get it perfect at first shot. CMH road as a roller coaster? I am not too sure vinod if the gradient could help cos the elevation is in the wrong place..all the super tall pillars are in the begining of CMH road which itself is on an natural elevation.. Understand there is trough as CMH road meets Swami Vivekananda road(Ulsoor)..and I was thinking elevation there would have made sense..but why early on CMH road? To reduce noise and vibration effect cos biz establishments are too close? Update: Was seeing the picture of the CMH road station and tht explained the reason for the height..its because they are also constructng the station below it..two levels..guess the ticketing and other facilites will be on one floor and commuters have to get to the next level where the platform will be there..this is because of not having enough space for station on CMH road! "PRIPL Executive Chairman L S Patil, told a press conference on Thursday that the total distance covered under this project would be 84.6 kilometres, which includes double track." "He said that track work would begin by the end of February or March first week of 2010 on Reach-1 and was optimistic about completing Reach-1 by September 2010 as rolling stock, signalling and communication system had to be tested thereafter." Third rail does not seem to play a major role. I guess parallelity will not be such a big thing for third rail. Also I hope there is a solid plan that supports the optimism. A risk register of things than can go wrong and delay the work and some mitigating steps will be helpful. Any delay to September means a cascading effect to further testing. This news item reports that the state has exempted BEML from VAT & CST for Metro coach construction. BMRCL has put out its Oct newsletter. Very poor progress on Reach 1 through September. Really don't see how any train is going to run on this by Dec 2010. Segments cast - just 43 - they should have done 90-93 (not 130) to stay on time. New running rate will be 100. I have this suspicion that the casting process is severely constrained. I hope BMRCL is doing some root cause analysis of this slow progress. Else Dec 2010 is a pipe dream. Metro by Dec-2010 ? No way ! Those who believe BMRC about reach-1 operation by Dec-2010 & the entire phase-1 by end-2012 - I am willing to bet that this will never be so. Wrote a mail to BMRCL on this. I wrote to BMRCL on the slow progress. I doubt I will get any response, but did it nonetheless. Their segment casting rate hit a high of 94 in July. So they do seem to have the capacity to cast at the required rate. Was it the monsoons that slowed things down? "54 spans of Viaduct have been erected on M.G.Road stretch from Trinity Circle towards Cricket stadium"
This means to say they have not counted spans erected elsewhere on reach-1.As i have observed there are 5 spans completed on the old madras side by navayuga. So the total spans erected on reach one will be 59. And also gammon has erected its girders for launching segments from OMR station to Byapannahalli depot. 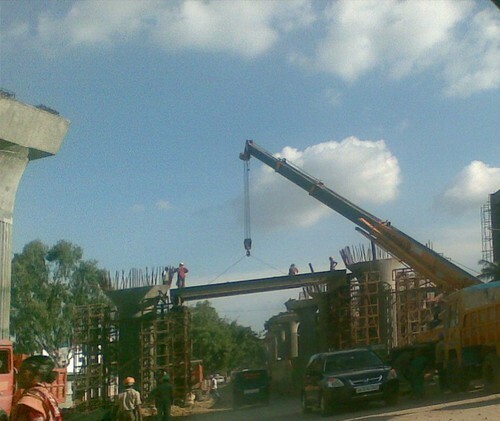 One more launching girder getting positoned on 80 feet road-OMR junction. So segment launching will start from this end to CMH road station sometime soon. In one month 5 spans completed from OMR station to 80-feet road by navayuga in september. There are approximately 6 spans to be completed till 80ft road,plus a insitu curve. So latest by mid of november the duct form OMR station to 80-feet road will be complete. The viaduct from HSBC to brigade-kamaraj junction is complete. Insitu across the junction in progress. 3-4 spans after the junction to be completed to meet the plaza station. The viaduct from the plaza station towards police ground is almost complete. Insitu across trinity circle has made good progress, from where gammon will move towards SV road station. I wish we could have meeting with the BMRCL people at this crucial juncture to get know the real status from their end. The most difficult part of reach-1 has been left for the last., CMH road to SV road to trinity circle. Drove through SV road to trinity stretch on a rainy day, its quite a nightmare. They have cast 800 segments. That should be enough for 90-95 spans. So they have a buffer inventory of segments to keep the work going. But they have to pick up the speed soon, unless they are deliberately going slow as storage might be a problem?? 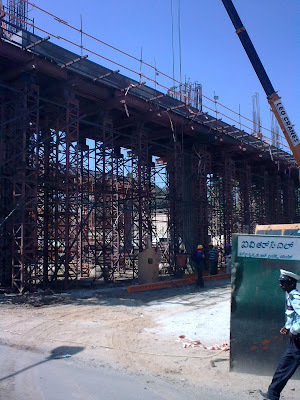 MG Road viaduct should be complete no later than Dec 2009 going by your observations. Which means that rails can start being laid on this stretch. BYP to BM Sri circle will also be done by Dec or Jan? That leaves the CMH Road to Trinity. If all the equipment released from the other parts of this stretch are put on the job, Aug-Sep for the viaduct seems feasible. All not lost? Am waiting for the response to my email to them. The portal which leads into the depot, below is the new road alignment. 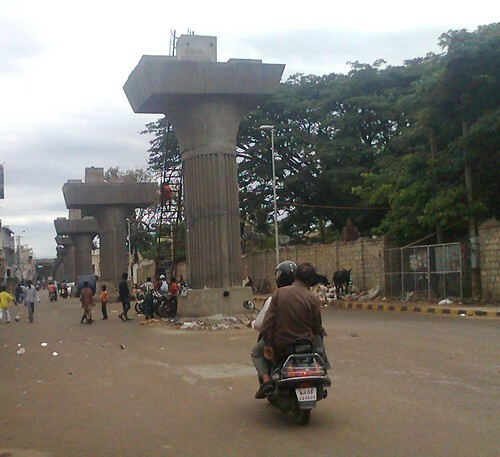 CMH road pillar , the tallest ones on reach one near the CMH road station. CMH road station, no work happening! At junction of CMH road and SV road. The worst stretch in reach-1 in terms of difficulty motorists and pedestrains. S V Road station. One of the first stations where work started, progressing at a sluggish pace. After the last monthly praja meet i took a walk from 80-feet road to till SV road station. As walked along i felt the need for station somewhere between CMH road station and SV road station. The distance between the two stations is for sure more than 1km which is norm for distance between any two stations. I similarly don't get the point in having two stations with 300-400 mts at minsk square and vidhana soudha as raised by blrsri. 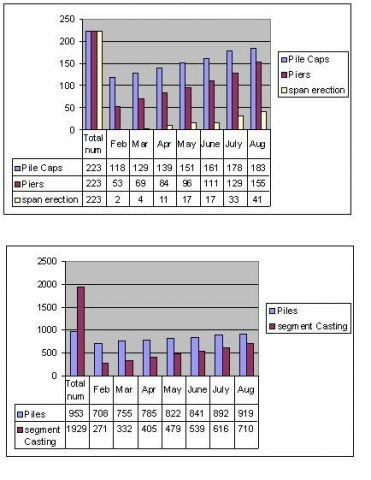 The november news letter is out and it seems BMRC has made decent progress in the last one month. Piers - significant progress, 23 piers erected; 23 more to be done in reach-1; at this rate should be completed by month end. Most of these piers are near SV road, CMH road junction. Span erection- 68 spans completed in total so far. 9 spans in november. Trinity circle junction closed for the next two days to bridge the pillars across the junction. 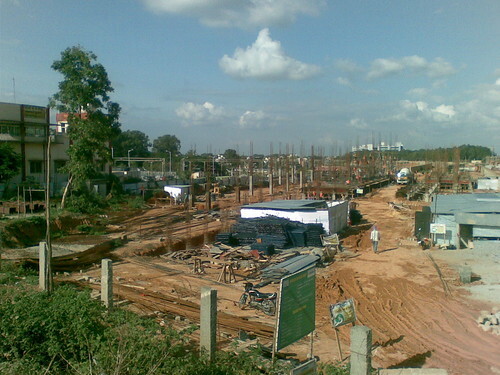 Gammon has erected 1 span near old madras road station towards the byappanahalli terminal. Segment casting-58 segments cast in november, decent pace nothing to feel proud of. Total of 860 segments enough for around 95 spans. 1.The contract award last month to samsung led consortia for AFC(automatic Fare collection) has been challenged in high court by the rival spain based bidder. 5.Litigation regarding location of minsk square station. 1. Reach-4 is on schedule, with BMRC calling it the model reach for progress. 218 piles out 617 piles completed. Pier work and segment casting in progress. @yajaman: Third rail contract yet to awarded. my assumption previously that it was a part of the same track laying tender doesn't hold. Thanks for the report (was a little disappointed seeing a one-liner yesterday). Your analyses are very informative. The last table is telling - looks like they missed their internal goals. Wonder what goals they missed? BTW, good pictures by psaram in case you missed. Would you have some time to update those wonderful bar charts for Reach 1 ? The December 2009 newsletter is out and it looks like it is a cut and paste of November report atleast for reach 1. Reach 4: May be the first to finish including stations ! Of late i find this exercise of updating the bar chart of reach-1 is not of much use anymore. Because data provided in the newsletter by BMRC is at best laughable. Just compare the november 09 and december 09 newsletter. Only change/update in reach-1 is replacing 61 with 68 for the number of spans between trinity and cricket stadium. I dunno why BMRC always says trinity to cricket stadium only in reach-1,doesn't consider any other part of reach-1 for spans updation. With these kind of poor data presentation, no wonder people are up in arms against BMRC for its lack of transparency and more. 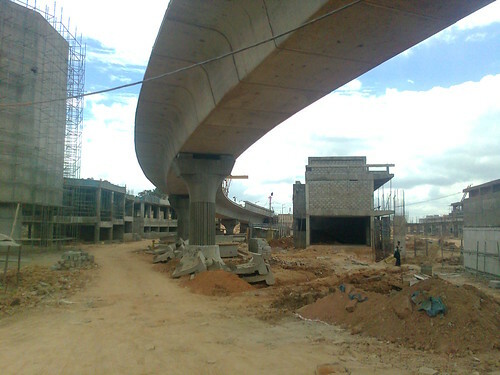 At the other end of OMR station gammon has erected 4 spans toward byappanahalli station. The pace of span erection has gained significant momentum. As observed today, gammon completed the obligatory span across trinity circle, a major in-situ work. Another launching girder being readied on M.G. road to join trinity station with the obligatory span. With this M..G road portion viaduct should be done. ABB awarded electrical works contract including thrid rail traction. Undergound tender undecided due to high cost quotes. Plan to split the UG sections and re-tender. With these issues, UG section will not be complete by 2012. Reach-3 contract terminated and no updates on how this reach will be done now. Reach-4 is the only saving grace.. Even the span numbers remain unchanged from November. If you look up at your post for November, it was 68 spans in November. It looks like either a copy paste job or putting in the wrong version. I wrote to BMRCL, but expect nothing. The Bangalore Metro Rail Corporation Limited (BMRCL) board that met here on Tuesday, awarded the tender contract pertaining to a portion of the underground (UG) stretch on the East-West corridor, to a joint venture consortia. The joint venture consortia is led by Continental Engineering Corporation (Taiwan) and Soma Construction (India), which emerged as the lowest bidder after financial evaluation has secured the tender contract, according to sources. The value of the contract, has however, not been announced. Finally a move which gives hope! I truly had a dream! How would Bengalurians like to see all the piers of Namma Metro being covered by lush green plants / creepers et al? Last time I met their Chief Architect he said they were considering leasing each pier out (or each stretch of piers out) to Advertising companies to advertise their products, earning additional income for BMRCL in the bargain. While we cannot grudge them this, my fear is that these piers would end up being used as walls to plaster them with political posters once election time comes. Then they will never be cleaned. Just see what is happening in the flyover piers of Richmond Road flyover. Now my dream imagined a situation where we could request and use public opinion pressure on BMRCL to genuinely show their care for a greener Bengaluru by covering the piers with lush green creepers and plants which nowadays can be built modularly, requiring no maintenance! I do not mean plastic plants. Genuine green plants. Afterall BMRCL has destroyed Bengaluru's green cover by removing over 3000 trees. Dont they owe this to us in some small measure? 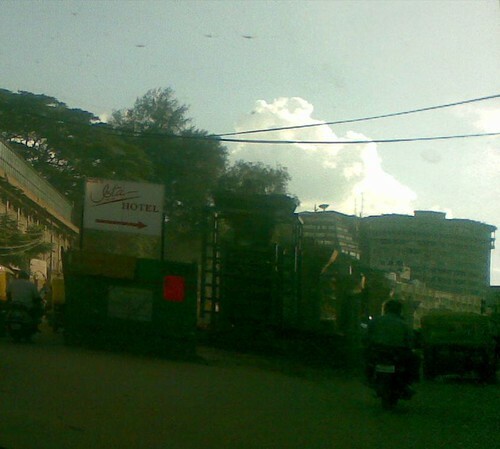 The boulevard on MG road had bouganvilla(a creeper) before BMRCL destroyed it. It will be worthwhile if we work this out for the reach 1 itself. I had apprehensions of the creeper roots causing damage to pillars..however the links given above provide very good way to tackling this problem..we can use a cheaper locally available alternates.. If left untended hooligans will put up posters of useless people grinning!! However not sure if Mr Sivasailam's brigade will accept this thought .cos the thought in the camp is..'we are here to run trains and make profit' ! Yes, BMRCL is "here to run trains and make profit", but I think that is where Prajagalus could start building up significant public opinion. I have personally talked to quite a few Senior BMRCL officials who are appreciative of the idea. Perhaps a via-media can be found by getting large multinational companies (Coke, Airtel et al) to advertise their brand names above and below a large portion of the middle section where these vertical gardens can be created. It will look beautiful and will also serve the purpose of earning some revenue for BMRC. No the piers will not be affected by water as it can easily be backed by impermeable liners which are 100% water proof. Of course I do not agree that every time a new concept is suggested we should go into an overdrive to find cheaper alternatives. Why invent the wheel all over again when people with year's of experience have already invented and fine tuned it to best effects? Is there any monthly Prajaa Meeting Scheduled for Dec 2009..? I am looking for some platform where our suggestions will reach the authorities and found this tracker from Praja. As all of you people know about communication gap between different entities of our Bengaluru (BBMP, BMRCL, BWSSB, etc) is taking a toll on its citizens. In last couple of months BBMP painting Bengluru with beautifull arts on its road sides, walls, pillars..... Its Really a goood move and in way promoting Karnataka Tourism. Similarly they painted Walls of LalBagh with some of the Best arts in Oct 09. This how they say we are spending so much for beautification of namma Bengaluru. but I see something similar foolish thing will happen by BMRCL in near future. These BMRCL, BBMP, BDA will make Bangalore's future worst with some of their worst plans to troubling Bangaloreans. At the same time if act smartly they do really have power and authority to get praise from citizen importantly make Bengaluru Garden City. I have couple of suggetions and simple plans which makes life easy for civilians and also unnecessarily money will not be wasted again and again for simple tasks. I am not her suggest like make metro underground or change system nothing of that sort. But i would request these authorities to sync up with each other before its too late. Like it happened in Tollgate underpass where metro pillars were standing muxh before start of Reach work on that stretch. They say they have Vision 2015 or Master Plan 2020 where is that available. This thread is meant for tracking the progress for namma metro, so if you have any suggestion/idea not relevant to metro, refrain from posting the same here, instead start a new thread about your suggestion/ idea. No harm intended, just trying to keep the discussion focussed. As usual, it is a copy and paste of the previous month's news. There is not much info about the reach 4 and 3 in news letter against real progress. I see considerable progress against the other 2 reaches(2 n 3). It seems they may start operating from in mid 2011 itself. Already plenty of piers have come up in RV road from Terminal towards west gate. and they are setting up span launcher near Terminal side. Also L&T is doing fast work on KR road and lalbagh stations. I am not sure how to update the snaps in this for tracking. I had to run an errand in the MG road area this weekend. In a moment of pedestrian insanity, on the way back, I decided to walk from Trinity circle to Airport road via Ulsoor, CMH road and Indiragar 100 ft road. Took some pictures which are posted below as an update. The whole route is like a war zone. Construction has upended the whole route. Not only is vehicular traffic impacted, there is absolutely no level surface for pedestrians to walk peacefully. I had one almost fall when the choice of where to step proved to be poor. One more perspective of the beam. The turn to Indiranagar 100 ft road from CMH road. The Toyz and Toyz building becomes an island. After the curve heading off into 100 ft road. I did not walk up to take a look, but it looked like all the spans had been erected upto OMR. I just came back from dinner near Bhasyam circle in Sadashivnagar. The footpath on the main road is incomplete - and looks like it has been that way for months - with open drains - and part which is complete is still unwalkable. No metro here ;). Whole of Blr may be a war zone...but the CMH road and Ulsoor road are like ground zero of a nuclear catastrophe! Its a big lesson for BMRCL..that is, if they want to learn//not to take metro through lanes which are less than 80 ft.. If they do, then they have to finish and get out of the place like clock work..else ppl there are doomed.. 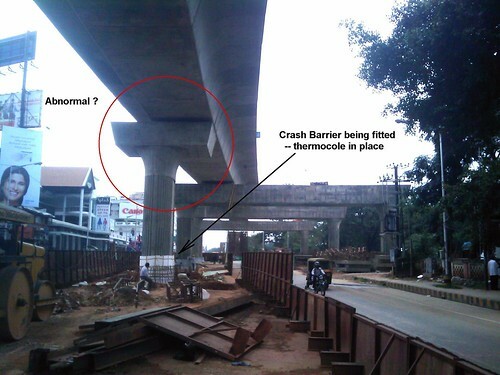 Concerning CMH Road - I suppose it may have been a deliberate act of the BMRCL to destroy that road. If you recall the merchants on CMH Road had strongly protested the Metro coming that way. Perhaps in return for that the BMRCL has decided to ruin them by not making the road at all usable. The road exists and is wide enough - but is in such an awful state that it is unusable and so its not clear why they havent made it usuable.This is not the case elsewhere - for example on Chord Road or MG Road itself. Navayuga was cited as the reason..
and as the story goes BMRCL then fired the contractor for the delay on CMH road..btw did they? about cases by shop owners on CMH road..BMRCL should be no place for personal vendatta..btw the worst affected are the small time shos down CMH road and in Ulsoor.. The big stores shift anyways..as they sit on funds..its the small garland vendors and petty shop keepers who get most affected.. Nothing much about real facts in newsletter. Viaduct work complete seems to be an error. Viaduct ought to include the spans as well. Only 100 were complete last month out of 223 or so. Maybe what they mean is the piers/pillars. Anyway good that the roads AND hopefully pavements on all the affected stretches will be put back in order. With this current state of METRO development progressing, when will this open to public for travell????. Will its happen this year or when next year. This will give relief to MG road., Indiranagar, Ulasoor some relief. The viaduct is fully done from surjandas-OMR junction till 100ft- cmh road junction. CMH road has been aspalted in bits and pieces, but things seem to be improving for the better for both pedestrains and commuters. 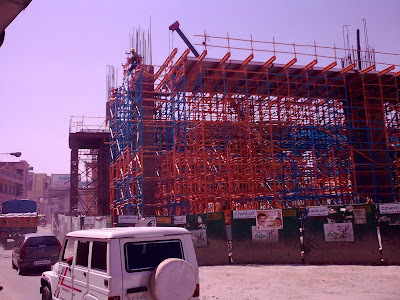 Station works at OMR station is going on at brisk pace. Will probably be the first station to get completed. Following posts (Total 391 Posts) in the Operation & Maintenance Wing of BMRCL. have been called. Now BMTC & BMRC should work out the single ticket system and Commuter Rail System by SWR will be in place by the time METRO starts. Then authorites should work out single monthly pass or daily single ticket netween these three transport systems. why are pillars sized differently? 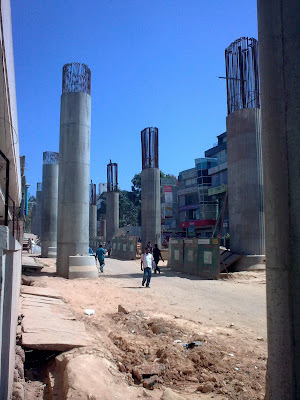 The reach 1 pillars from Byp to MG road are circular and looks huge..these were done by Navyuga.. However the pillars put up by Punj-Loyd on CHord road are oval and looks smaller too! The pillars near lalbaugh are also circular but looks smaller in footprint too..
What abt the design here? The coach load is uniform and shouldnt the design of supporting infra also be optimized? Why have different designs for each section? Just becos the contractor is different? Reply to: " why are pillars sized differently? " All the pillars in Reach 1 are completely developoed by Navayuga only. Due to delay in execution, only launching spans in 3 sections are off loaded to Gammon. Secondly, the variation in design is not because of change is contractor, its depending on hight of pillar nad soil areao take load and sustain vibrations. All the pillars in reach1 are completely executed by Navayuga only. Due to delay in work, launching of spans in 3 sections is transferred to Gammon. Variation in design is due to height, and soil in sorrounding area. If observe it as height increases shape tends to be oval to carry load. Plan to use carbon fibres in metro! This is an excellent idea coming from Bangalore which has the distinction of industries using carbon fibres in NAL and HAL for LCA and ALH.. Guess Chandra is referring to this company..
Kalam's dream of research finding place in everyday implementations will come true! BMRC plans to harvest rainwater at the stations. Plans for common ticketing would be introduced. Battery buses will be deployed to carry passengers to the metro stations for last mile connectivity! We are fast approaching the d-day and the pace is frantic at the metro construction site.. 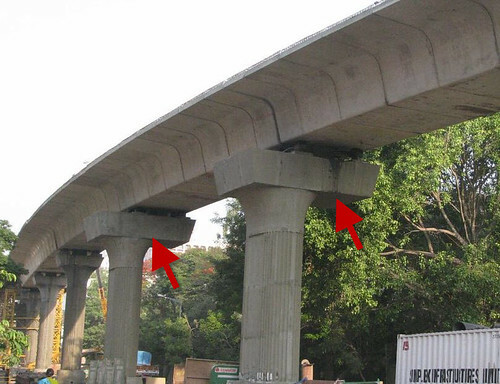 However one thing that concerns me is the the way the spans are resting on the pillars..below is an example.. There is an offset in the way the spans rest on the pillars.. Simple engineering principles say that when we are designing a cantilever..there is enforcement built in the supporting structures..when we see these pillars(quite a few along reach 1) they dont look any special than the reset! This means that either the load to be borne(as a cantilever) is well under control or the design is skewed which could affect stability..hope its not the latter..
Do any of you have a better explanation for it? My observation of the pillars (at trinity circle) is that the ones where the viaduct is off centre are thicker than the normal pillars. It isn't apparent - at first it just looks like the pillars are shorter, but then you realize that there is no change in the height of the viaduct from the prior, normal pillar and it is just a visual trick due to the additional thickness. However one thing that concerns me is the the way the spans are resting on the pillars. I think this has got something to do with the centrifugal force when the carriages are making a turn on the track. Roads are usually banked but I presume it is hard to do that on these concrete spans. Instead, they seem to have used offset, which has a similar effect. If these 'offset' pillars are present only where the track is turning, this might indeed be the case. The construction of a three-level concourse to connect the M G Road station... will begin after two or three months..... The station will be operational (December 2010) without the concourse. So, this is what was meant when Dec 2010 date for Reach-1 was quoted! "The design of the structure is being modified to accommodate a memorial to the Father of the Nation, Mahatma Gandhi, as the station will be bear his name. 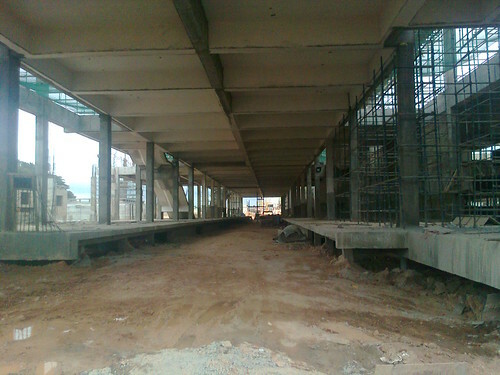 The concourse could be completed by May or June 2011” said BMRCL engineers. Welcome concept. But wonder why they didn't think of it earlier. Report says "The design of the structure is being modified to accommodate a memorial to the Father of the Nation". Being modified now!? Would have been great to see them flag off their first train from Mahatma Gandhi's memorial! BMRC June 2010 newsletter makes a mention of Integration of Metro with BMTC. the Secretary, Transport Department GOK. Secretary, Transport Department suggested the BMTC to look for battery operated, front door, less seating and more standing buses for convenient travel and cost effectiveness for which BMTC agreed. Wonder what the finalized routes are for the five stations... Any body with more info? You may ask Bangalore city connect directly for the details. Their is no effort either by BMRCL / SWR to have integration with Biyyappanahalli and Yesvanthpur Railway Stations with METRO. As this issue was discussed in BMLTA meeting. Even SWR DRM has agreed in 2008'dec BMLTA meeting and agreed to come out with solution of integration aspect of smooth changeover from METRO to Railway Stations. I think we need to file an RTI with both BMRCL and SWR on the status of integration. whats about battery driven busses? Yaake..we cannot or should not travel by diesel busses? This is more like expecting EMU for the CRS from day one..
Btw BMTC should be made aware of not to expect positive ridership numbers for first few months..as the reach 1 is very short and also basically for fun rides only! Traffic between MG Road to OMR is a high traffic stretch. It may take around 30-45 mins max to reach starting station Chinnaswamy Stadium from South and West Bangalore such as BSK, Gandhi Bazaar, Vijaynagar, Vyalikaval etc. Ride from Stadium to Byappanahalli will take around 15 mins. From Byappanahalli to ITPL and Ring Road SEZ stretch, it may take 15-20 mins. These figures are not good during non-peak hours. But, during peak hours, it normally takes 1:30 - 2 hrs which will get reduced to 1 hr - 1hr 15 min. What we need is connecting buses on either sides. BMRCL has to work with BMTC or sub contract to a private firm for the same before this becomes operational. Dummies have come in time.. They landed at Chn port and have been placed at Kumble circle as of yesterday..shrouded and to be inagurated on the occassion of BSY's 2 year completion! What was the govt's 'real' contribution for the metro in last two years? 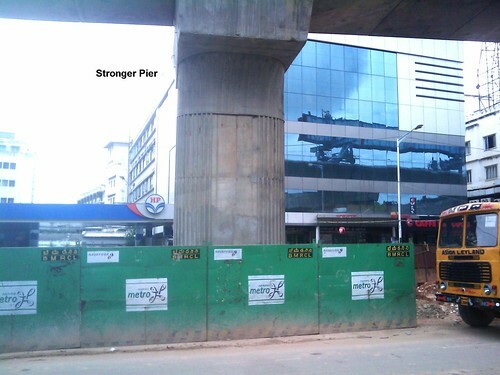 The work progresses/limps cos of the corporation..why is yeddy and his men shouting abt metro in banners around Blr? The underground sections work has not started and there are so many issues with other sections..but the CM's PR office seems to be very good in gathering scraps..they also hold a all india hockey tournament in Yeddys name! Why? we did not have Vajpayee to name it on? COming back to metro..did we need a full scale model before the real ones come in 2 months time? I have my doubts after visiting the Byappanahalli terminal today..here are some snaps from there.. The above pic is where the ramp hits grade at the NGEF grounds..there is atleast 1 span just before this pic which still needs to be hoisted! The above pic is where the trains should eventually come to a halt and the PM/CM should be flagging off the trains..there are two levels to this station..wonder why! This is the front of the station facing the Byp IR platform(on right)..accross this is the KSRTC terminal..wonder what is the plan to get to there.. Overall..this looks like it migh take longer to finish..Bangalore Mirror mentioned July 2011 as the start date..maybe thats realistic! On the other hand CM is saying in the press that the date(dec 2010) will be preponed..wonder who played the pungi to his ears! 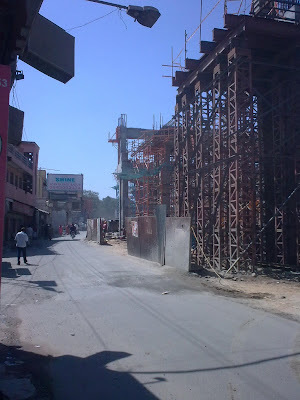 CMH road metro works incomplete! Was shocked to see yesterday that CMH road was almost incomplete..still CM claims we can prepone! How?? While hearing BMRCL’s plea for vacating a stay order on Metro works near Chinnaswamy stadium, Justice Ram Mohan Reddy pulled up the BMRCL officials for bad design of the Metro rail project. This stay has been ordered since February 6, 2010, that means Chinnaswamy Stadium Station work has been stopped. As BMRCL & CM of Karnataka are claiming METRO will start from Dec'2010, this is fooling people. Under ground Station near High Court is also stayed by PIL. and Govt approval was not taken, last week only taken Cabinet approval on this. Other underground works orders have not been released to Vendors, this shows, Project METRO will get delayed and now BMRCL should give realistic dates on the completion. I don't know should I comment this way or not on Judge, but personal opinion is that he is very selfish. Since it created mess in front of his house, he is angry about BMRCL and hence he is putting stay on Chinnaswamy Stadium Construction. India and Bangalore cannot progress until we have these self oriented people. Why not BMRCL move to higher courts like NICE did. Bangalore badly needs Metro and it is getting delayed by many such unwanted litigations. I pass i front of his house almost everyday..I see that the pace is fast(reach 4) but really not that noisy.. They have already brought down part of Vasavi institution bldg for metro and just after that is the property of this lady who has raised this issue..all she needs is more money/compensation per sft price..! Guess BMRCL will do an off court with her and shut this Justice's mouth..
Btw the KR road station is coming out really well..will post some pics soon! Sadly, it's almost laughable that this has been discussed on Praja almost 20 months back! It could have been ready by now. Anyone else see a common thread running through here? Why not start the metro service in completed elevated sections instead of waiting for the underground section to finish? I believe Dubai Metro had started with 10 stations instead of the 40 stations planned so that they could start on time. COnsideing the fact the underground sections work will take way too long a time to even start(2011?? )..the plan is to have this initial all elevated rail from Byp to Cricket Stadium and the next to go live is the elevated section from Swastik(Malleshwaram) to Ypr.. Though reach 4 work is happenin fast we cannot run train there unless the ug section completes as there is no depot on that part! Was on CMH road yest and found that the pace of work is slow..there are still 8 pillars just standing bare..no spans erected..going by optimistic estimates this should take a week for each pillar..
That is 8 weeks..after that the barricades need to be erected and tracks to be laid..
Will this all be done by oct this year to run trains by dec? Guess someone in press needs to start a countdown like the CWG one...to track BSY words that train will run by dec this year..there are many banners around city where hes gloating about the year end metro run..
Take Extension to ITPL Before Underground Section Completes. We have seen the pace of the Namma Metro. Why not Phase-2 be started in parallel. Atleast the paper work and design should be finished before launch of Phase 1 Reach 1. There is an urgent need for the Phase 1 Reach 1 extension to ITPL because of the volume of traffic which is ITPL bound. If they can start now, by the time underground section finishes, it would really worth for the pains public took all these days. BMRCL is working on the extension of Metro from RV Road Terminal to Kanakapura Road already, on the other hand I have not seen any progress on extension of Reach 1 to ITPL. Don't know the logic of BMRCL/ Rites behind this. Vasanth - what about DPR, arranging finances, land acquisition, etc for ph-2 ? I think these will start soon after reach-1 is commissioned since ph-2 is in DPR stage (physical surveys have probably been completed). They may also go for private financing to meet costs of ph-2 as central govt is considering withdrawl of assistance for mass transits. I had an opportunity to interact with our MLA / Minister Sri Limbavali today. He said that he tried his best to get Metro extension to ITPL in phase I, but that is not happening. Only expected in Phase II. Recently for this post, Naveen had said since there is no Depot infrastructure on Reach 2 and Reach 4, connectivity is not possible until underground section finishes. If we closely analyze, travel time for reach 4 from RV Road terminal to KR Market (where underground section begins)would be 10-15 mins maximum. Sameway between Nayandahalli to Magadi road Leprosy Hospital(again where underground section begins). If we could have two trains in each reach, we can have atleast 15 minutes frequency. Each train wiil be on the same track. for both the directions without the need for changing track at the terminal station. If BMRCL can provide infrastructure to change the track as well, trains can run with increased/ proposed frequency. Looking at the progress, Reach 2 between Swastik and Peenya is lagging behind a lot compared to Reach 3 and Reach 4. Reach 4 between Market and RV Terminal is progressing well. If we keep on waiting for underground section to complete, we have to keep on waiting thinking 'there is light at the end of tunnel'. Though Vasanth Rao agreed that the actual structure of the second station may take even an year to complete, he opined that it will not affect the operation of Reach-1. “We’ll have the other station operating in full and are confident of completing the basic structure including the passage connecting the second station for operational purpose. Hence, there should be no problem in meeting the deadline. Admittedly, while what Rao envisions as a basic structure is up for debate, the idea of a grey, ghostly, incomplete shell of a station that's expected to convince people to swith to PT sounds like a big non-starter. Call me a cynic of the system, but I would prefer a project that misses its deadline (even though it's the nth one) but has the bells and whistles from Day 1 than just the 'basic structure'. TM, I feel driving stress on the roads will be a major driver for ppl to switch to the metro..I am one of those waiting to start using this line as it starts..
Doesnt matter if some parts of it is yet to be finished! Reach-1 civil works are still on at almost all stations whilst work on Plaza stn (MG Rd) is yet to commence. I guess station finishing works (tiling, glass work, etc) would take atleast 2-3 months after civil works. So, realistically, Metro Reach-1 may commence operations only sometime in April-May, 2011, assuming Plaza stn work begins soon without delay. Ministers & officials keep insisting that Metro reach-1 will be made operational in end-2010, but none dare see the writing on the wall & are going along with mere wishful thinking. I am at a loss to understand how the construction of a station building on the erstwhile Plaza theatre premises has anything to do with whether Reach 1 can start running in December are not. Bear in mind that the MG Road station is the terminal station as far as Reach 1 is concerned. Considering that trains will be run at a frequency of 10 minutes or so (given the low ridership for a 7 km stretch), it will be enough to have only one platform ready and usable in the MG Road station (assuming there is the ability for trains to switch tracks at or before this station). All trains can come to that one platform, allow passengers can disembark & board, then reverse direction and head back. All that is required is the two level structure - one for the platform and one for ticketing. 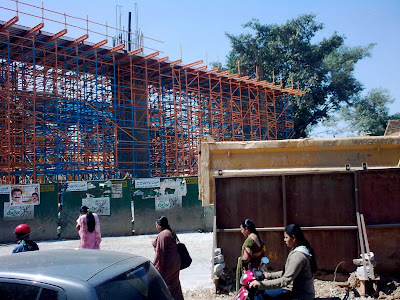 And this structure is well underway on what used to be the MG Road promenade. For many of the smaller, more bare-boned stations, this is pretty much all they will have even when complete. In MGR, the availabilty of such a large plot, more over one that also opens on to Church street, gives BMRCL the opportunity to do something more elaborate. I would rather they spent the time to get that bit right - they have 2 years till the UG section opens anyway. MG Road station is the terminal station as far as Reach 1 is concerned. MG Rd is not a 'terminal' stn, it's an intermediate stn (Cricket stadium & Baiyyapanahalli are the terminals for reach-1). ability for trains to switch tracks at or before this station. Switching tracks are probably planned around cricket stadium (terminal stn) & may not be built at Plaza, even as a stop gap. Wonder where in the world they have such half finished structures for metros - I haven't seen any ! As previously mentioned, plastering of walls, tiling of floors, glass on roofs /sides, installation of escalators, lifts, doing up interiors for toilets, ticket offices, finishing of stairways & balustrades, etc are all pending & may not be completed by end-2010. Now that you mention it, I recall that originally Reach 1 was supposed to be from Baiyyapanahallito Cricket Stadium. However some things have changed along the way. The original plan was for Cricket Stadium to be an elevated station. But BMRCL did some minor rerouting, to minimize incursion into Cubbon park iirc. So now the station variously called Cricket Stadium/Minsk Square/Cubbon park is to be an underground station - it is included in the tender for the UG segment. The viaduct, as built presently, takes a curve off MG Road and then starts dipping down in the Police Wireless Office area, adjacent to Police Grounds. It then ends - nothing after that. From that point, the track are supposed to run at-grade across Police Grounds (per present plans) before hitting the Cricket Stadium/Minsk Sq Station. This part is yet to be built - there is barricading and some earth moving machinery on Police Grounds, but that's about it. So MG Road it is for now. This section between Baiyappanahalli to MG Road will be commissioned in Dec’2010. Where is the September newsletter? Generally these newsletters come out by the 10th of every month. No news so far this month. Just a bad guess - BMRC may not want to reprint the statement that Reach-1 will be commissioned in Dec 2010.
cos all are in Korea inspecting the coaches from Rotem..also most of reports abt NM comes from press these days as the d-day is approaching.. The Bangalore Metro Rail Corporation Limited (BMRCL) is gearing up for the trial run of the metro coaches that arrived last month. While the mock run is expected to be conducted in the middle of this month, BMRCL has also stepped on the pedal to speed up the construction work to meet the proposed December deadline for commissioning of Reach-1 (Byappanahalli to Chinnaswamy Stadium). Though only 47 per cent of the overall work is complete at the Byappanahalli depot, BMRCL is confident of completing crucial/functional part of the construction for the December commissioning so that the Reach-1 can function. The entire depot will be completed in March 2011. Also, the signalling work is attaining some progress, they said, adding that Alstom India Project Limited, Alstom, France and Thales, Spain have been awarded the project. The stretch of land near the Chinnaswamy Stadium in the City will soon be a wall that divides two different and splendid worlds. Below the “wall”, the Namma Metro will zip past taking people to the nook and cranny of the IT hub and above it, there will be lush lawns to be used for sports such as tennis. A deal towards this was struck in the Karnataka High Court on Wednesday, as Justice Ram Mohan Reddy cleared all the hurdles for the construction of metro rail facilities through the Karnataka State Cricket Association (KSCA) land. Also their was Tender for selecting Contractors for Mejestic Underground Station METRO. Now METRO is progressing quite well. This small streatch of 7 Kms which has been planned by Jan'2011 will it serve any purpose ??? Integration with Baiyyappanhalli Railway Station and Extending the this segment further to Whietfiled on priority will get good ridership, as the Underground work is yet to start, that means complete METRO of 33 Kms will be opened only in 2014. So its better they should take up the Whietfiled side work on priority as the people travelling to ITPL is very high, they get benifit as well as METRO ridership will iimprove. This extension to ITPL from Byp will give true meaning to the metro..hope the govt listens amidst all their squabbles of survival.. It aint gonna cost them much either as the route has a median in most places..this route is anytime better than the puttenahalli extension of reach 4! Bus Lane from Byappanahalli to ITPL? It is a high challenge, but if implemented will end the wait for extension of Metro from BYPL to ITPL on OMR. KR Puram Bridge is the main hurdle. Can we look into alternative roads to link ITPL from BYPL Station with Bus Priority Lane? Increased FAR and related issues.. There is an article in the papers today which says that the FAR increase feature for properties within 150mts from the metro station has not been used by anyone! There are some questions which come up on what they are talking here.. If there is a 2400 sqft site, with the FAR 4, a 9600 sqft construction can come up on that plot..so what is the number of floor allowed for that? There is also a BDA clause that for every 3mts/1 floor rise..a 1 mts offset need to be provided..which means a 6 floor bldg will need an offset of 6mts(20 ft)..which is ridiculous.. There is no way that a FAR 4 can be achieved on a 2400 sqft site! According to town planners, BMRCL’s offer comes with a rider. FAR of 4 will work for plots measuring up to an acre, as the formula allocates huge setback space. For instance, for every three metres of vertical construction (one floor), rules specify one metre of setback. This can be achieved only with reconstitution of plots. Which means that a builder, who wants to avail of the higher FAR, will have to either buy adjacent plots or enter into joint development agreements. What they actually meant to say was that plot sizes have to be about 1 acre or larger (above 4000 sq.m) to qualify for the higher FAR of 4.0 since setbacks will have to be increased substantially (the words used to describe it in the report are inaccurate). Thus, a 2400 sq.ft plot (223 sq.m) will not qualify for higher FAR. As per BDA -RMP-2015, the setbacks & FAR for building Height up to 11.5m & Plot size of up to 4000sq.m (Table-8 on RMP), with width/depth of site above 9m are: Front-12%; Left, Right & Rear-8%. The setbacks become more stringent for bldgs above 11.5m height. In Commercial (Central) areas, the recommended FAR is 2.5 & max ground coverage is 75% (plots upto 500sq.m are exempt from setbacks except in the front). Plot size 360-4000 sq.m > additional 0.25; Plot size above 4000 sq.m > additional 0.5. Thus, FAR for plots over 4000 sq.m becomes 3.0. For Metro corridors (150m each side), this is further relaxed to 4.0, provided the plot size is over 4000 sq.m & irrespective of land use. Notice Inviting Tender & Details for Providing all the three services viz. 3) Manpower for customer care and operating the Ticket office machine. Last date for submission of this tender: 28/Dec/2010. Go figure when the trains will start to run then. At the Byappanahalli Depot, which not only shelters the trains but will also be the major control centre for Namma Metro operations, the boundary and retaining walls and diversion road construction are complete. Construction of other buildings, including work on stabling shed, repair workshop, administrative building and washing plant is still going on. Metro officials, however, claim it is under “advanced stage of construction”. Similarly, work on laying of the ballast-less track began early in September 2009. It is still in progress and expected to be completed by mid-December. The statutory speed trial test can commence after that. This 7-km stretch on Reach 1 has six stations — Byappanahalli, C.M.H. Road, Ulsoor, S.V. Road, Trinity Circle and M.G. Road. While the Byappanahalli Station is at-grade (ground level), the rest are elevated stations. Only two-third of the work on these stations is complete and it is unlikely that it will be completed by the end of December. Putting in place the many amenities, including escalators and elevators, is yet to be taken up in these stations. Passenger concourse, restrooms, ticket counters and even shelters in some stations, are yet to come up. BMRCL has only just invited tenders for agencies to handle security, housekeeping and ticket counter-related works. 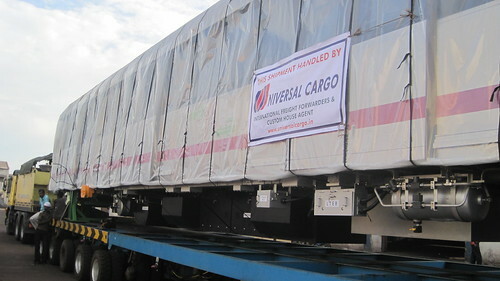 Initially, five sets of trains are being imported from South Korea and the remaining will be assembled at Bharat Earth Movers Limited (BEML) here. The first train set arrived during the last week of October, while the next two sets of trains are expected by December second week. The remaining two sets are likely to arrive by December-end or January first week. Asked about the year-end deadline, a spokesperson said BMRCL had only said that it will be “ready to operate” the trains by December-end. “This does not mean launching of commercial operations,” he reasoned. “By the end of December, we will get the track and train certified for safety by the Commissioner of Railway Safety. Launching commercial operations depends on the will of the Government,” he said. Going by the progress of the works, obtaining the safety certificate after successfully completing the trial run before December-end itself could be a major achievement for BMRCL. That means they may open to public only just before 30th March. Then imagine about the completing of Phase-1 , next 4 yrs??? Do we deserve this, why State & Centre should provide an alternate mode of Transport till this goes on. Even though only about 75 per cent of the work of Namma Metro is complete on Reach 1 between Byappanahalli and M.G. 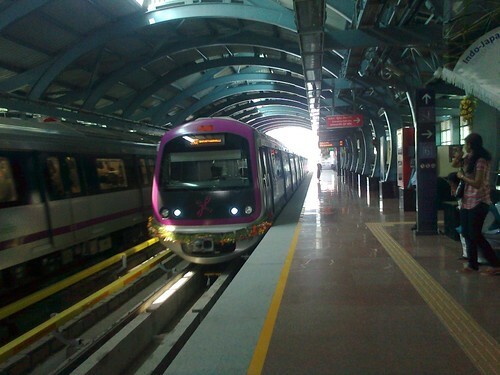 Road, the Bangalore Metro Rail Corporation Ltd. (BMRCL) is still hopeful of commissioning it by December-end. I had forecast the delay over a year ago here. I don't think BMRCL alone are to be blamed - the various obstacles (Navayuaga & the slow pace by other contractors, court cases, KSCA, CMH, Hasiru Usiru, etc) were bound to impact the deadlines. What has been strange is that BMRCL as the builder has been in chorus with the politicians in repeatedly re-affirming a Dec-end start. They should have made more realistic projections for completion deadlines. Perhaps, they are still unable to "predict" how many more such hurdles might come up - this is India, after all ! ... is out. See here. Some pictures of test track and AFC machines. Language of 'will be commissioned' in Dec (from prev newsletters) has disappeared as anticipated. 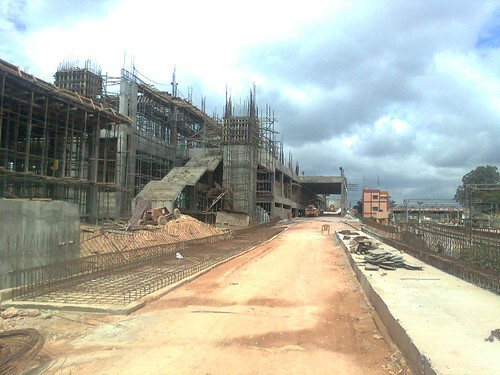 72% of civil work is completed in all stations along Reach-1.Full completion expected by December-2010. Can you say you commissioned Reach 1 without a functional OCC? Seems to me that there may be some mechanical completion of the route itself by Dec. No operations at least till March 2011. Whats the deal with the shocking pink and flourescent green coulours on the turnstile ? They seem to be designed to be attractive to 12 year old girls ! guess the pink is more to mark the line..this color is on the train too..as the phII starts coming up..probably there will be another underground station on MG road marked by a different color..
Dont understand the green though..guess thats plastic and some smart brain at BMRCL wanted some traffic colors there instead.. Testing from BYPL to MGROAD from Dec 10th - To belive or not? Don't know to believe or not to, yesterday in an FM station they were telling testing on BYPL depot tracks will be done this weekend and BYPL to MG Road will be done starting from Dec 10. Centre for Metro Rail Safety Commission (If I am right with the name) needs the trains to be run 3,000 kms for their testing. Hence trains have to make 3,000/14 (7kms one side, 14 to and fro) number of trips between BYPL to MGROAD for the certification. MGRoad station work is going on in full swing as reported by radio and night traffic on the mgroad is blocked for the movement of Station construction vehicles. Yesterday was travelling the metro route on the way back from work..was really disspointed to see so much work yet to be done..the MG road stations along with the OMR one are the ones which are at some stage close to completion.. The CMH rd stn and the Ulsoor one need lot of work..the other observation is the pace of work around the stations..it almost too slow and the few workers there seem to have no urgency of any kind..reminds me of the Navyuga days when there would be one guy with a hammer on the whole MG road barricaded stretch.. Coaches for the second phase of the Bangalore metro will be provided by the unit of BEML located in Palakkad, Kerala. The Palakkad unit of BEML produces metro coaches, stainless steel EMU coaches, overhead inspection cars, utility vehicles, AC/DC electrical multiple units, broad-gauge rail bus and spoil disposal units for trains and coaches. video of metro test run..
mute the speakers..found the music harsh! Even though providing feeder services for Metro was planned two years ago, the actual work is being hastened only now. BMTC Managing Director Syed Zameer Pasha told Deccan Herald: “We are working on the feeder routes and our aim is to finalise a foolproof service connecting vital areas to metro stations and terminals.” According to sources in BMTC, two preliminary meetings have already taken place in October. “We will soon announce the routes to the public,” they said. I'm sure announcing the routes to the public few months before the actual start will help make it more foolproof - they'd get a chance to gauge user responses. Youtube video on today's trial run of Metro. Someone's mobile pictures posted already on youtube. got all excited about the trial run and made it to byp at 4..spoke to the main engineer there..he mentioned that there were two runs today till CMH rd..
both the runs were made with manual signalling since the auto signals are not ready yet.. He mentioned that the next run all the way to MG road is only planned after Jan 20th.. so the official trial run is only to start around republic day! Per this DH report today, BMRCL MD Shivasailam says Reach-1 will be ready for commercial operation by 15/March. Commuters will have to temporarily use the “emergency exit” for alighting from the Metro while travelling from Byappanahalli towards MG Road and then reach the concourse below the tracks. “They will have to use the same side of the station on MG Road to exit the Metro till the completion of the Plaza structure,” the BMRCL managing director said. After reach-1, per the same DH story, Reach 3 and 3A are next to open (swastik to YPR and YPR to Peenya Depot), by March/Apr next year. 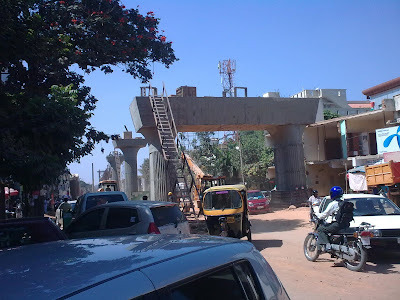 Reach 4 (Market - RV Road - Puttenahalli) might be the last stretch of Metro to be opened for public since it has to connect to Reach 3 & 3A (Yeshwantpur to Swastik) via underground section work of which is yet to commence. Reach 3 - Reach 4 linking underground section would be the toughest as per BMRCL since it goes 18-20 feet below ground level and primarily uses Tunnel Boring Machine. Reach 4 Via ducts are complete from Lalbagh to South End circle. Work needs to be done on South End Circle and South End Station. Again viaduct is fully done between South end circle on RV Road to end of RV Road connecting the Marenahalli Road. Jayanagar station is progressing well, so is Lalbagh station and KR Road National College Station. Stretch between Lalbagh westgate and KR Road is pending. Contractor (I think L&T) is supposed to be good in this section. 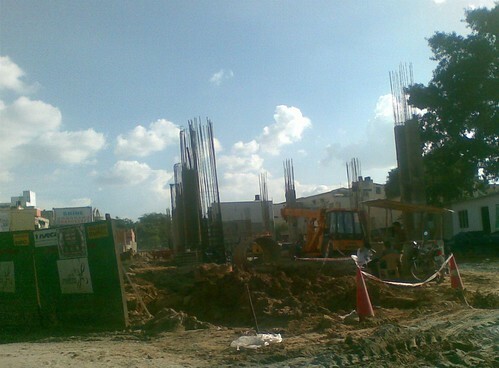 On the other hand, Reach 2 (Magadi Road Entrance, Leprosy Hospital to Mysore Road) is progressing at snail pace. Even Pier work is yet to be started on the Mysore road between BHEL and Nayandahalli. 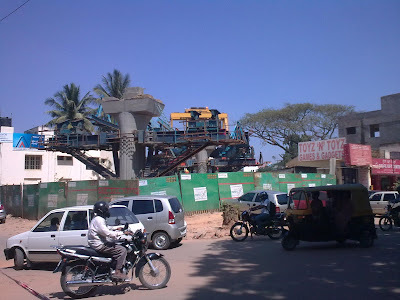 Pier work is in progress on the chord road connecting Mysore Road and Magadi Road. This reach will connect reach 1 and it should be ready by 2013 atleast compared to reach 4 which is supposed to be ready by 2014. Reach 3, is also very poor. No work has been started in the section between Swastik Station to KC General Hospital, Malleswaram where Metro is supposed to run above Indian Railway track connecting SBC and Yeshwantpur. This section of Indian Railways is electified. Don't know how it will be worked out. Haven't seen further. It would be nice if anyone can update on Reach 3. BMRCL confirms Metro commercial launch on Ugadi day (4/Apr), per this DH Report today. 94 users have liked, including you. coaches come back with scratches on the sides..after a trial run..
Hope they have the coaches are covered under insurance..
..also the inspecting railway ppl not budging afterall turned out to be a good thing..we really cannot afford a loaded train leaving the tracks and tumbling onto the road below! I am now worried really! Giving more space for the train on the side isnt the answer. It will only prevent scratches not a tilt or derailment. WIth a full train we are at the mercy of the driver running against schedule of course wear & tear. Demand a public hearing from BMRCL? Delay in security clearance, coaches damaged, stations on Reach 1 far from completion, UG work running behind schedule (correct?). Tired of hearing bits and pieces through trained journalists. BMRCL will do well to hold a public hearing of sorts to do some PR directly with the public. A televised public hearing would be great. Just come clean, clarify on delays, give out latest ETAs for completions, reach by reach. metro not in sight..but foto's nice! Sivasailams dead line almost have no meaning now..the latest being that the opening is moved to month end..
meanwhile there was a nice pic on the web of the empty station and tracks.. Note: Showing picture (Slang Kannada : ಪಿಕ್ಚರ್ ತೋರ್ಸೋದು ) means showing a lucerative future falsely, just to keep attraction on. BBMP need to work smarter.. The Palike plans to fill all potholes, beautify pavements, create a litter-free zone and develop greenery at all the junctions along the Reach-1 of the Metro rail. BBMP might go ahead with doing some tactical projects to get the roads ready before metro opens but they should really not loose track on the long term..cos we all know..the pot hole filling exercise is very temporary.. The actual plan of involving BMRCL to clean up their work by putting up white topping of the road along the entire stretch of 8 Kms should be done asap.. Thanks all for tracking and posting here, although with lesser activity in recent days. Let us continue to track other reaches closely. how about tracking what works and what doesn't in the reach 1? i would think such an analysis would help in tweaking the plans for other reaches. i think over all, this is just the beginning. nothing major is going to change overnight. but in the long run, when a major chunk of the network is complete and when tweaks (such as feeders, co-ordination, services, and even adminstrative org etc.,) have been made to customize the whole service to Blr, this will change the face of blr. in the meanwhile i expect many of the earlier naysayers to chime in. If not on the first day, could ride the metro the second day today..will try to list my experience here..
11:11 the train arrived like a fast catterpillar..it was neat..not crowded..the announcements over the PA system was over lapping between opposite platforms as trains arrived on both sides..something need to be done about that..
11:30 was on the road at the SV road station..there were 2 shuttules waiting..but none going towards suranjan das road..flagged an auto..as usual the auto quotes 50 Rs for the 2 Km ride..refused to pay and walked to suranjan das road.. Lesson learnt is that to come to Bagmane...need to travel to Byp station for the shuttle..Byp is better connected!! Would encourage all to try the metro soon! Offices running shuttles such as a shuttle from BTP as well as from whitefield and ORR regions will help lot of people to reach atleast MG Road. MG Road station has got prepaid auto counter. Can reach to Corporation Circle and take buses from there. Also buses bound to Shivajinagar take left at the Brigade Road MG Road junction. If that frequency is increased, that would connect lot of areas to MG Road station. For instance form my home all 34 series buses stop in that junction. Metro feeder from BYPL should improve further. We should get connectivity to Surjandas Road, Marathalli, ITPL. If BMTC can put some of its empty running 335E Volvos from BYPL Metro station to ITPL it will ease things a lot. After experimenting with different plants..looks like BMRCL has finally taken the cue from discussions above.. They are planting bouganvilla creepers below the viaduct..and have scrapped the other thought of having stainless steeel barricades..
Looks a good move..but still considering the amount of traffic MG road has..I am skeptical if those plants will survive either! They said my pre-paid card validity was 1 year only, hence wanted to use it up and went on the metro today..ridership seems to increased marginally.. There were 25 ppl earlier this year at the 10:40 AM trip..with about 15 of them with cameras..today it was about 35 with 10 of them posing for photos.. Still no shuttle as I got out at BYP..had to walk half distance before hopping on a rick for 20rs to my office..cycles would have been great! Btw the ride has become noisier cos they are driving like my dad on this scooter...with the brakes always on! 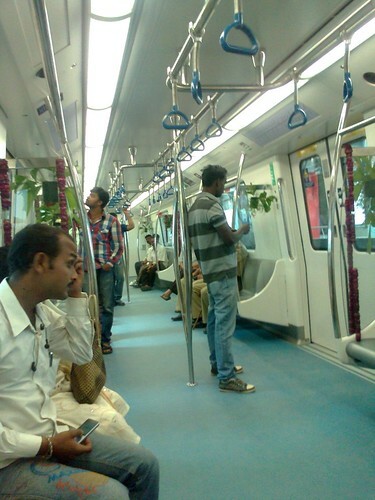 Last year on October 20th Namma Metro Services Started for the first time in Garden City. Reach 1 is already carrying 20,000 passengers daily with 90% of them being regular commuters. There are many suggestions for scope for improvements, but , I would say staff on Namma Metro has been highly professional. Wish to have other reaches and underground stretch of Phase 1 complete ASAP and take up more and more passengers off the roads onto the rails. It is a happy news that Reach 4 will be planned to be started along with Reach 3 in mid 2013. I would have been very happy if the Baiyyappanahalli Station integration with METRO had it been completed and MG road station Footover bridge, its really pathetic to see even these small things not completed by BMRC Mgt. Devaiyya Park station to Pennya Depot should hav been ready & now execue is after the Devaiyya Park 65M span is given excuse for not starting. Even Yesvanthpur Station is not integrated with METRO station?? Sanjeev, Yeshwantpur Metro Station is integrated with Metro. It is right infront of Yeshwantpur Station and the escalator of Metro station right infront of Yeshwantpur Station. Sad thing is the BMTC's TTMC is not integrated and there is very little pedestrain facilities. What was announced as a New Year’s gift to the city — the East West corridor of the Metro line connecting Byappanahalli and Mysuru Road — may take a ‘few more months’ to become operational. Though trials on the stretch have been going on for the past two months, BMRCL said the Commissioner of Railway Safety, who has to give the final go ahead, is yet to be approached. Tentatively, Metro says the request may be sent only by January-end. However, if one goes by the experience of the Magadi Road line, commencement of operations may be some months away. It took seven months after trials began for the CRS – who was preoccupied with other railway investigations – to give the green signal for the line. For the trials in the underground section between M.G. Road station and Magadi Road station, Namma Metro had for the first time in India employed the Instrumented Measuring Wheel, a pair of wheels imported from Sweden which are fitted with GPS, gyroscope and many other modern instruments. They were fitted on a coach. For over six nights, the coach zoomed on the lines at over 90kmph. Officials were also testing the steep curves (around 120m radius between Minsk Square station and Vidhana Soudha, which is not seen in other metros). Apart from over 75 engineers, members of the Research Designs & Standards Organization also took part in the tests. Learning from the struggles in burrowing underneath a city that sits on mounds of quartzite, granite and hard rock, BMRCL hopes to be better prepared for Phase II, which features a larger underground section. Phase I has 8 km of underground lines. BMRCL officials said borewell rock testing for Phase I – to ascertain the kind of geology – was carried out at intervals of 100 metres along the line, depending on availability of space. However, with the second phase having 13.79-km of underground lines, metro officials said testing will be carried out at intervals of around 25 metres. Deadlines are out of the window as the work of Namma Metro encounters harsh ground realities. The most recent deadline given for the ambitious project was June 2016. Even this seems unlikely. Three tunnel boring machines (TBMs) are drilling their way towards Kempegowda Interchange, but since December they have not covered more than 120 metres, which leaves a further 1,350m to go. There is no headway on one of the tunnels — between Chikpet and Majestic. “It is taking time to tunnel in these stretches. The hard rock, particularly quartzite, is causing carbon monoxide and heat build up in the tunnels. We need to wait till the tunnel cools down and ensure that the area is safe for our workers before they fix rings,” said U.A. 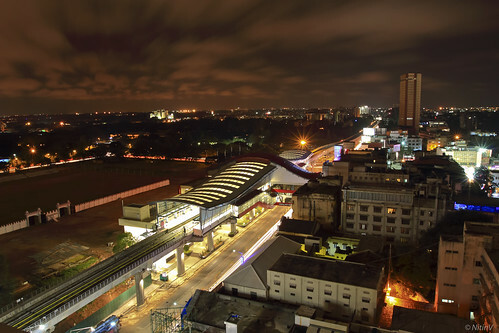 Vasant Rao, spokesperson of Bangalore Metro Rail Corporation Ltd. Nearly a decade ago, when construction began, officials announced that the project would be completed by 2013. Since then, numerous deadlines have gone by. BMRCL is no more giving out deadlines. This is what metro man Sreedharan said yesterday about the metro work in Ph 1 Wonder what he meant and wonder if the whole thing will stay under wraps for ever! 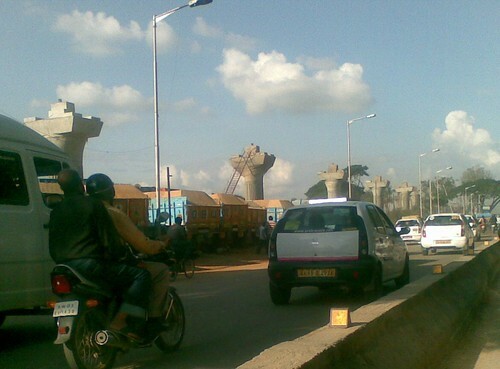 BMRCL is a parastal, which has done little to alleviate traffic woes in Bangalore. Only Bangaloreans who are not even aware of what suburban rail is shall go gaga over such systems.